Indian Veterinary Association, Kerala organised Dr. C.Gopakumar commemoration meeting on 11.01.2019 at PWD Rest House,Thiruvalla. The function was inaugurated by Sri. Mathew T. Thomas, Hon. MLA of Thiruvalla. Dr. B. Bahuleyan, President, IVA Kerala presided over the function. Dr. H. Sajeev, District President, IVA, Pathanamthitta enlightened the audience the biography of Dr. Gopakumar. Dr. Babu Abraham, District Animal Husbandry Officer, Pathanamthitta, Sri. M. Unnikrushnan IFS, DFO Ranni and Dr. Rajesh Kumar S., General Secretary, IVA Kerala delivered the memorial speeches. Dr. Santhosh Kumar, Chief Veterinary Officer, Dr. Rahul Nair, District Secretary, IVA, Dr. Pradip Kumar P., Treasurer and Dr. Cicily Anna Basil spoke during the function. The speakers recollected their association with Dr. Gopakumar and his selfless service to the society. Dr. Joju Johns, Veterinary Surgeon and wild life expert handled a session on "Wildlife Anaesthesia - Special Considerations, Challenges and opportunities" during the function. The family members of Dr. Gopakumar were present on the occasion. A benevolent fund of Rs. five lakhs from KEOF was handed over to the family during the function. 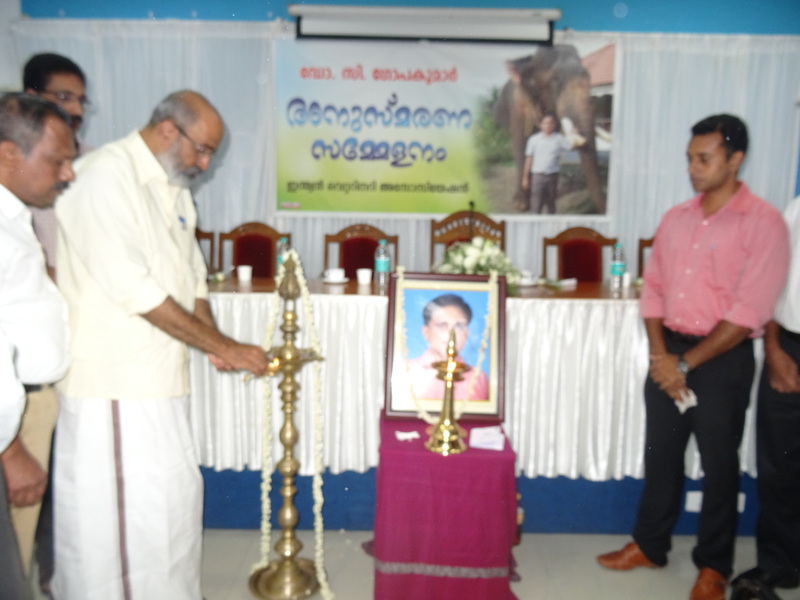 Indian Veterinary Association, Kerala pays tribute to the memories of a great, dedicated veterinarian, Dr. C. Gopakumar.